Find artworks, auction results, sale prices and pictures of Miguel Covarrubias at auctions worldwide. 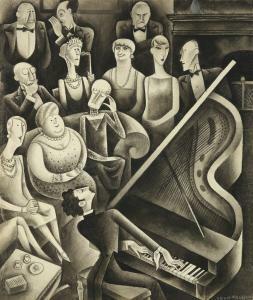 A SALON RECITAL OF MODERN MUSIC Miguel Covarrubias 1904 - 1957 Signed Covarrubias (lower right) Brush and ink, pencil and gouache on paper 11 3/8 by 9 5/8 in. 29 by 24.4 cm Executed in 1929. 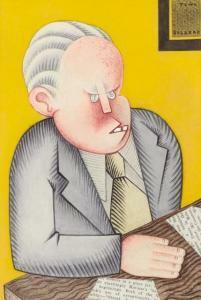 Provenance Sale: Trinity International Auctions and Appraisals, Connecticut, March 8, 2014, lot 51 Acquired at the above sale Catalogue Note This work is an original illustration executed for Vanity Fair,ed. 54, publishedFebruary 1929. 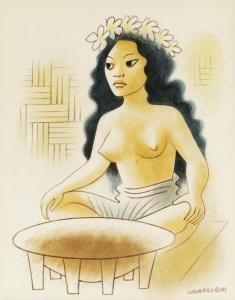 MIGUEL COVARRUBIAS Typee Girl with a Kava Bowl. Watercolor and brown ink on paper, circa 1935. 285x247 mm; 11 1/4x9 3/4 inches. Signed in brown ink, lower right recto. Accompanying this lot is a letter of authenticity by Adriana Williams. Ex-collection private collection, New York. The current lot is one of many illustrations Covarrubias designed for the book Typee--A Romance of the South Seas, by Herman Melville, although it was not included in the final publication. 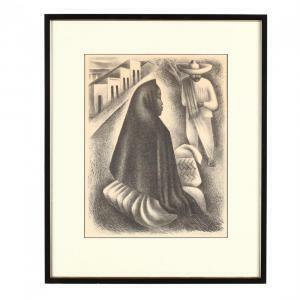 Miguel Covarrubias (Mexican, 1904-1957), Mexican 0237lithograph, 1940, pencil signed at lower right, edition of 250, published by Associated American Artists, New York, and retains their label, matted and framed. Image Size 12 1/2 x 9 7/8 in. ; DOA 19 x 15 3/4 in. Estate of the late Margaret M. Ryan, Durham, NC Additional high-resolution photos are available at Leland Little.comConditionOverall good apparent condition; some toning; not examined out of frame.